As a student, you can create your own Student Groups for study groups, discuss an assignment, etc. You can be part of more than one student group. 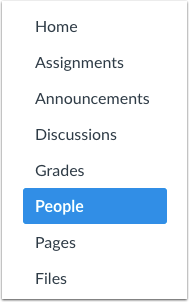 Note: If you cannot see the People tab in your course, or if you cannot see the Add Group button, your instructor has restricted this feature. You can also access your User Groups through the Settings menu. Click the Options icon  and click the View User Groups link . Name the group by typing in the group name field . Determine who can join the group by clicking the Joining drop-down menu . If you want anyone in the course to join your group, choose the Course members are free to join option. 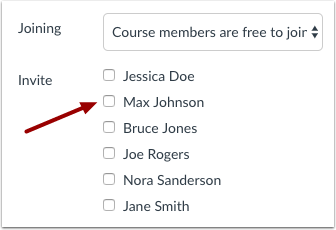 If you want to create a group with only specific people in your course, choose the Membership by invitation only option. Invite users to join the group by clicking the checkbox next to each user's name. Users are listed alphabetically by last name. 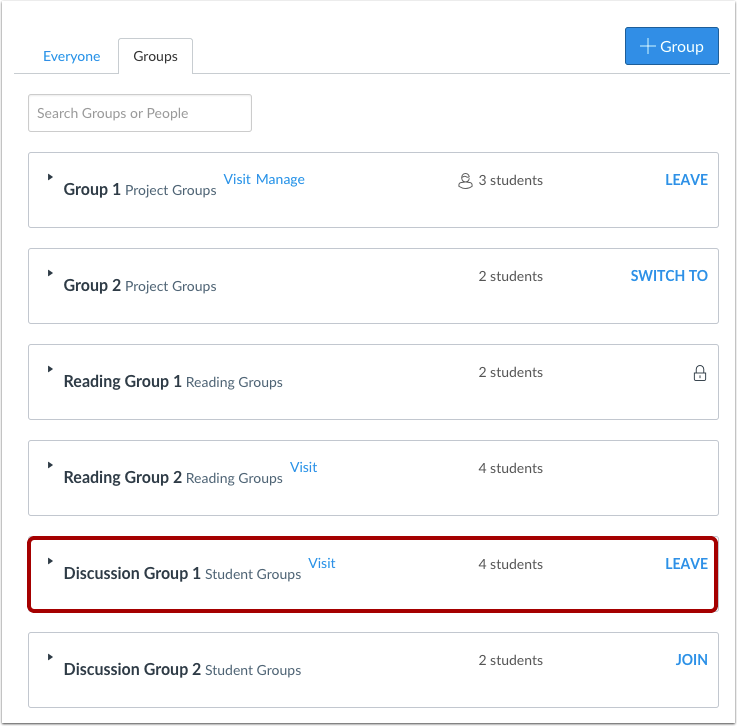 If you set the group membership option so that anyone can join, but you choose to select only a few of the students to invite to the group, the remaining students who were not invited can see the group in the student group list and can join the student group later. If you set the group membership option as invitation only, students who were not invited will not be able to see the group in the student group list. If you want to add a new user to an invitation-only group at a later time, contact your instructor for assistance. Click the Submit button to create a new group. 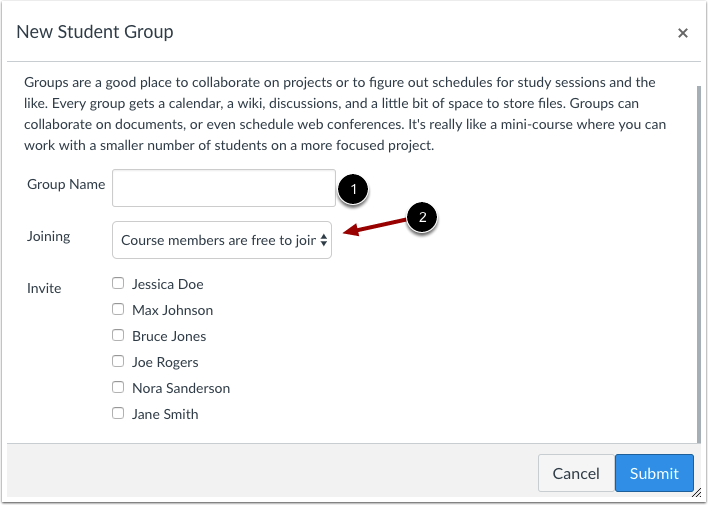 The new group you created will now appear in your course groups. If you need to change the details of your group later, such as renaming the group you created, click the Edit Group  button. To switch between groups you have created, click the Switch Groups  link. Previous Topic:How do I leave a group as a student? Next Topic:How do I upload a file to a group? Table of Contents > People and Groups > How do I create a group as a student? Re: How are students in a group discussion, using the Mobile App, able to post to the main discussion?